NCT 127, a Seoul-based unit of S.M. 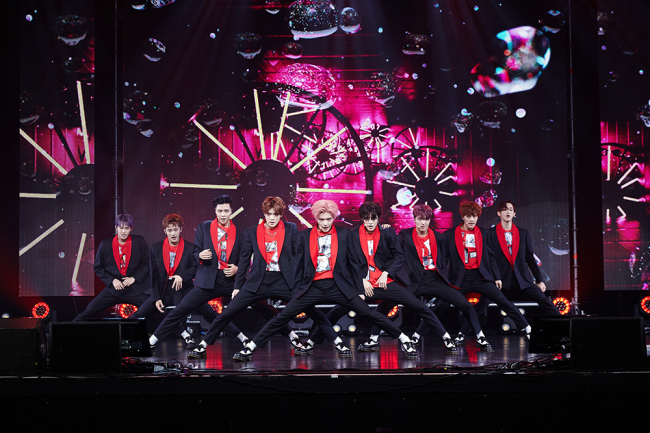 Entertainment’s NCT boy band project, dropped its third EP “Cherry Bomb,” led by the modern hip-hop title track, Wednesday. “‘Cherry Bomb’ is our best and finest work that boasts spectacular performances. While I like every single song from the new EP, the lead track is my favorite, as I had to go through countless revisions and struggles writing the song,” said Taeyong at a press showcase Wednesday that marked the group’s first showcase since its debut. With bandmate Mark, Taeyong participated in writing five tracks, including the title track, in the seven-track album. Mark also named “Cherry Bomb” his favorite for similar reasons to Taeyong. True to its name, “Cherry Bomb” is a powerful hip-hop tune with a pulsating and brassy backing chorus. The performance-driven anthem features intense, eye-catching choreography. The band members said that they had to go through intense training to perfect the dance moves. “There is this special part in the choreography where we all have to put our legs apart in a lower position. That part always made us nervous because we’d often see our pants ripped after the performance,” said Jonny with a laugh. He added that Mark was the one who had the most trouble with his pants ripping. The bandmates also joked that they tried not to stretch their legs too wide when performing “Cherry Bomb” in front of reporters. Asked about NCT 127’s future plans, the band replied that they aim to become one of the most performance-centric K-pop groups that can satisfy viewers both musically and visually. NCT 127 debuted on the K-pop scene last July with its self-titled debut EP “NCT #127” with the lead single “Firetruck,” a trap-hip hop hybrid. Produced by S.M. Entertainment, NCT 127 is one of three groups currently active as part of the K-pop label’s larger NCT boy band project, with the concept of having an unlimited number of members divided into multiple subunits based in various cities around the world. The group gained worldwide attention with its second EP, “Limitless,” which debuted at No. 1 on Billboard’s World Albums Chart upon its release in January this year. NCT 127 is also set to attend KCON 2017 LA, which will take place at the Los Angeles Convention Center and the Staples Center from Aug. 18 to 20.